The Mysto Manufacturing Company, date unknown. 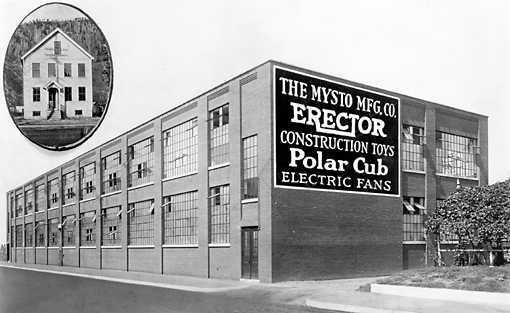 Inset: the first Mysto factory in Westerville, Conn. According to Dan Yett of the A.C. Gilbert Heritage Society (ACGHS), the building no longer stands, and the site is now vacant. In 1997, the ACGHS placed a bronze plaque on the site. (Gilbert Family Collection. Copy and Reuse Restrictions Apply).